Backflow prevention is not at the forefront of most design engineers' minds as this is a small component of the overall project design. Our aim is to make it both simple and painless to design the best backflow prevention system possible - including protection for the device. According to many of the designers we've worked with across the country, our website does exactly that. Not only do we provide a sizing guide which allows you to find the right backflow covers for your devices based on specifications such as valve type and pipe size, our product pages are also full of useful information to help with your design. The first thing you'll notice is the image of your selected enclosure model. There are 54 to choose from on our backflow preventer cover products page and each one includes an image of the cover. Next to this image are the basic specs. 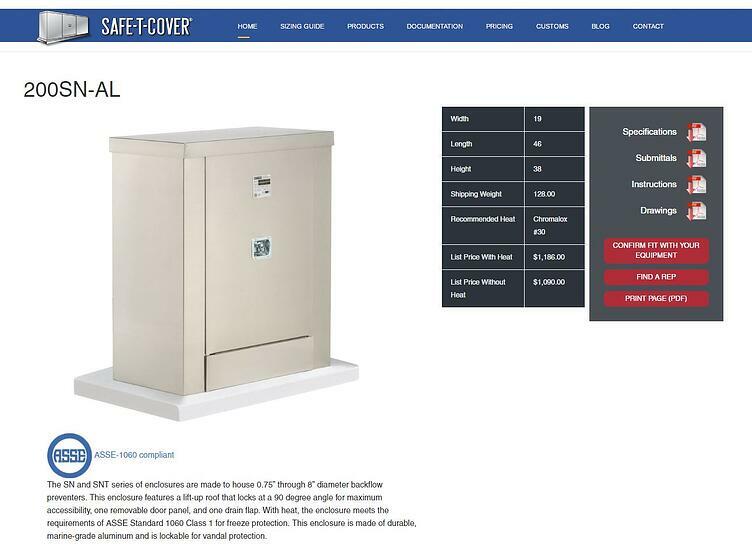 You can easily find the dimensions, weight, heat, and pricing for each of our standard model industrial enclosures. Below the image is a brief description of the product. Listed there is the number of removable panels, doors, drain flap and more. You can also see if the selected enclosure is one of a series and if you can get it in a different size. This is handy if you need to provide vandal and freeze protection for multiple backflow preventers on a job site. For instance, the 200SN is part of the SN series. The SN series can house backflow preventers from .75" to 8" diameters. Having all of the basic details of every product on one page makes finding the right backflow covers incredibly easy. However, we didn't want to stop there. We know that you're going to need specifactions, submittals, and more as well. So we uploaded all of those options for each model. Additionally, we've provided instructions for assembly in case you need to know what is required beforehand, or if you need to print an extra copy. There is also a standard drawing for each model. You can double check that this backflow cover is the right one for your equipment by clicking on the link that says "Confirm fit with your Equipment." 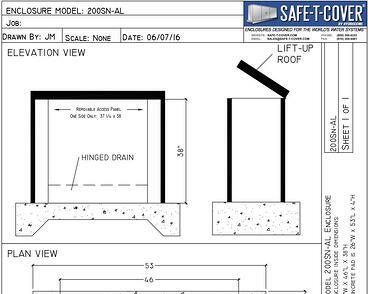 See an example of a drawing and submittal below. 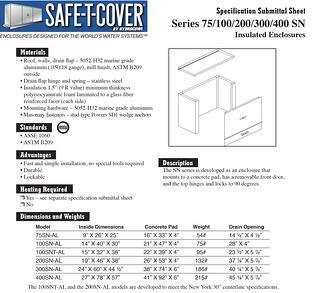 Safe-T-Cover’s entire production line of aluminum enclosures carry the seal of compliance for the ASSE 1060 standard. All enclosures shipped with our recommended heat comply with ASSE standard 1060 Class-1 because of our patented slab-mounted heater. A Safe-T-Cover box will cover any backflow preventer as well as most valves and pump systems. Our standard model enclosures even ship in four standard colors at no extra charge. You can find all the specific details about every standard model enclosure on our website, or simply call us up and ask us. We're always ready to help with questions and custom specifications.